Managing those stress levels. Learning to identify when your stress levels are rising as early as possible and then finding other ways of gaining relief from the frustration will all help you avoid reaching the point of overload that can result in yelling or being overly impatient and controlling. The person who grew up in a relatively relaxed and emotionally safe environment will generally be better able to identify that their stress levels are too high and will be less tolerant of living with such discomfort on an ongoing basis, hence likely to be more proactive about meeting their self-care needs. However, when someone grows up in an emotionally stifling, demanding or chaotic environment, their body becomes accustomed to the regular high peaks of stress and anxiety and rushes of adrenalin. Eventually the child’s physiological resting state, even when there isn’t an apparent threat, remains in a state of heightened stress and low (or high) level anxiety. The result is always living on the edge to one extent or another, but because this was normal as a child, it’s difficult for the person, as an adult, to recognize that they need and deserve to generally live in a more relaxed state. When living constantly with stress, the point of overload will be reached easier and faster than someone with an overall more relaxed nervous system. If this is the case for you, it’s helpful to think in terms of slowly but surely lowering your stress levels. Making the decision that you are someone who just has to avoid becoming overloaded can make a big difference and effect the choices you make, what you say “yes” to and what you say “no” to. I was talking with a client lately who was truly celebrating with me that she finally no longer dislikes herself. She didn't even realize that she disliked herself so much, when there was actually a lot of self-hatred and shame which made enjoyment of life nearly impossible. When she started parent coaching with me, I helped her identify what was really going on deep down inside in stressful moments at home with the kids. She’s an incredibly mindful, loving and dedicated mother, who would experience nothing short of anguish if she didn't manage to live up to her very high expectations. Being so self-critical caused her to have a very high need to control every aspect of her life and her parenting. Initially, the more she learned about peaceful parenting, the more anguish and guilt and fear she experienced, "have I damaged my children for life by doing cry it out when they were babies? ", "has my girl learned to repress her emotions and will she ever regain her full sense of trust in us? ", "why couldn't I get my kids to sleep on time last night, what am I doing wrong?". When she first contacted me I identified that peaceful parenting was verging on being counterproductive unless she brought in the balance of developing more compassion for herself. For this committed mum, learning to identify when she fell back into self-berating and then working to come back to a warmer softer connection with herself allowed her a lot more clarity and headspace to be more mindful and connected as a parent, which in turn made the less than ideal parenting moments or days much less scary and debilitating. What helps you soften towards yourself? For some it’s through meditation, journaling, yoga, exercising, counselling, date nights with partner, time with friends, giving time to your passions and interests. For others time in nature recharges their battery, creating an hour of self-reflection sitting outside relieves tensions. Take time each day to slow your breathing down, focusing on releasing stress on every outbreath and letting your awareness drop into your body sensations. When you do this, you’ll naturally become more aware of where your body is holding a lot of stress, which naturally brings about an urge to relax those muscles. The tracks on my Stress Relief for Parents CD can help you develop simple relaxation skills and help you explore the source of your emotional triggers. Honouring and caring for one’s emotional needs can be very difficult for parents if their feelings were not tuned in to with compassion when they were a child. When emotions were not taken seriously or empathized with in childhood, that person is trained to minimize, invalidate or hide in shame their true feelings. Learning to change these patterns and give to ourselves more compassion than we received as a child can feel like slow progress, but so essential and ultimately so rich and rewarding. An essential element of self-care is to develop connections with those who are sincere about being real and truly listening to each other. It’s the elements of feeling truly heard and understood with compassion that allows a person to move from talking about their problems to talking from and showing the underlying feelings, which can lead to satisfying emotional release and resolution. Crying can feel so very cleansing and relieving when the space is held by a calm, patient, and empathic listener. Their acceptance of your feelings helps you listen to yourself to glean the deeper insights and resolve feelings that may have previously felt so unmovable like the big rage and grief or shame that can otherwise compromise your clarity and confidence daily. 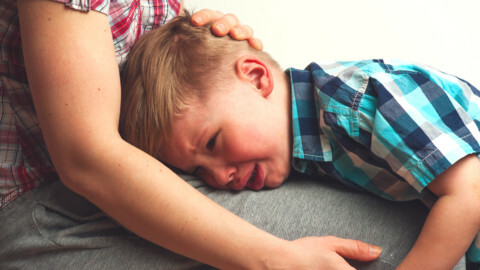 Why do many parents struggle to cope with their child’s cries? When there’s too much anger in the family, what’s needed? Parenting can be really hard when …….. When it comes to discipline, where do you draw the line? Can we meet our child’s needs even when our needs aren’t being met? My stress levels have certainly increase over the past couple of years since the birth of my child. Trying to to work, find grants for college, time to GO to college, etc on top of the most important thing, caring for my baby, just leaves little to no time for play. I think it’s important to have a little “me” time to clear your head. You have to make that time whether it requires you to get up at 5 AM or stay up until 1 AM. Just an hour of doing something you want to do goes a long way towards regaining your mental acuity. I can totally identify with the mother you used for this case study. High expectations of myself is debilitating, and defeating. It breaks connects to those your love, and yourself. Thanks for this article.